One of the most popular books at our school is Smile, a graphic novel by Raina Telgemeier, telling her story of going through middle school with braces and full-on dental drama. Kids adore the art, the realistic story and the heart in this graphic novel - they relate to Raina's struggles with friends and her dental drama. The kids I know are super-excited that her new book Drama is now available! It is a perfect tween story - filled with middle school angst, friendships and crushes. Callie LOVES being part of her school's drama productions - having fun with friends and working on great productions together. Seventh grade is full of ups and downs for Callie. She's got a huge crush on popular eighth-grader Greg and can't believe he kisses her. But the next day, Callie is devastated when he ignores her and returns to his stuck-up girlfriend, the ever-popular Bonnie. The drama continues as tryouts proceed for the school's production of Moon Over Mississippi. Callie decides that stage crew is definitely the best place for her, and she's determined to make the best set design possible. But life is never simple in middle school. Drama always finds its way in! Kids will relate to Callie's vulnerabilities, but they're also going to connect to her resilience - how her solid friendships keep her grounded and strong. Callie becomes good friends with Justin and Jesse, twins who have both joined the drama production. Early on in the story, Justin confides in Callie that he is gay. Telgemeier handles this with pitch-perfect sensitivity for tweens, showing Callie and Justin's emotions through this scene. I love how natural their conversation sounds and their expressions look - tentative and uncertain at first, then trusting and supportive. Telgemeier's artwork draws kids in. She shows the characters' emotions, focusing close in on reactions different characters have. Tweens are acutely aware of social situations and how they feel, as their emotions zoom up and down. They love the way that Telgemeier captures this drama in her artwork, feeling that she is capturing their own emotional reactions to their own school drama. Through it all, this book made me smile. I love the way Telgemeier captures so much of the struggle of middle school - trying to figure out who your real friends are, who you like, what you want to do. 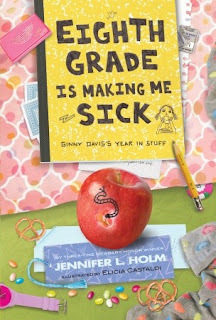 I know the 5th graders at my school will really like this, as they venture into the world of crushes and girl-boy drama. And all of the middle school students I've shared it with have given it rave reviews. Want to learn more about Raina Telgemeier and Drama? I loved this review in the New York Times. Check out this interview on the NerdyBookClub. I also love this advice she has for kids who want to create comics: 5 Things To Know About Cartooning. The review copy was sent by the publishers, Graphix / Scholastic. I've already bought several copies for friends! If you make a purchase using the Amazon links on this site, a small portion goes to Great Kid Books (at no cost to you!). Thank you for your support. The transition to a new school year is always tricky. Kids juggle their excitement and anxiety as they think about what the new year is going to be like. Will they make new friends? Will their old friends still like them? Will they get good teachers this year? Will the homework be awful? Will they even figure out where to go? The questions go on and on. Many tween girls love reading realistic fiction because it gives them a chance to look at all the social situations they deal with on a daily basis. If you know a tween who is just a wee-bit anxious about school this year, I think they'll really enjoy Eighth Grade Is Making Me Sick. Ginny's story of the ups and downs of her eighth grade year will make them smile and cringe. 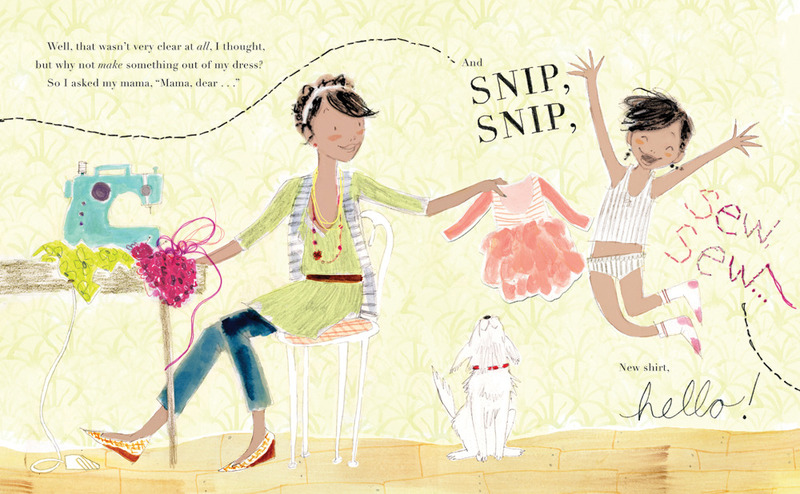 But best of all, kids will really be drawn to Jennifer Holm and Elicia Castaldi's visual scrapbook approach, telling Ginny's story through the stuff all around her. Ginny's life is full of notes and messages: doodles to friends, to-do lists, text messages, refrigerator notes from "The Management"(aka her mom), angry notes pinned to her door (stay out!) and teachers' notes on her homework assignments. Stuff surrounds her every day - her cell phone, her backpack, school supplies, lunches, even worms to dissect in the science lab. 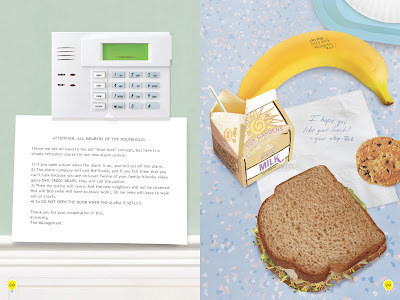 Holm and Castaldi show all this through a photo-collage that makes reading this book like peeking into someone's personal scrapbook or diary - the stuff of their life. Ginny's excited about the beginning of the new school year. She's just moved into a new, bigger house with her mom and step-dad. The beginning of the year goes pretty well. She likes her new science lab partner. She makes the cheerleading team. 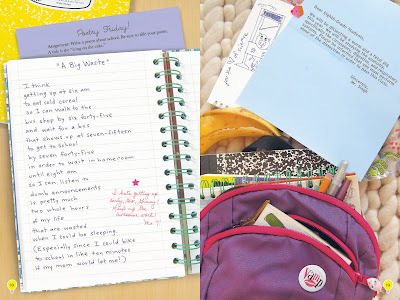 She even starts to fall in love (one of the big items on her "to do"list). But life throws curve balls, as every tween knows. Ginny's mom announces that she's pregnant; but it's when her step-dad loses his job a week before Christmas that everything starts to turn upside down. The visual storytelling will hook kids from the very beginning. Holm has created an authentic voice with Ginny. Her poems read like a kid trying to do an assignment, just to get it done. Kids will relate to Ginny's struggles at home and at school. But most of all, they will love having to figure out the story through all the clues. There isn't a straightforward narrative. You have to infer at each step of the way to fill in the missing pieces. And they will love seeing so many familiar parts of their own life in Ginny's stuff. Ginny is not a kid prone to reflecting on the intricacies of her life. On first read, this might seem like this story stays on the surface of Ginny's life. But there are big issues sandwiched between the text messages and homework assignments. Ginny wrestles with issues many kids see around them - relationships, job loss, stomach pains, family changes. The visual nature of the story and Ginny's authentic voice let kids read between the lines, thinking about how these changes are affecting Ginny more deeply than she always lets on. If you think your tween might like Eighth Grade is Making Me Sick, check out Ginny's first story: Middle School is Worse Than Meatloaf, Holm's and Castaldi's first collaboration. Although this new book is a sequel, continuing Ginny's story, I found that stood alone comfortably. Here's a video that Elicia Castaldi, the amazing illustrator, put together to show behind the scenes of making Eighth Grade Is Making Me Sick. Very fun peak into the artist's studio! 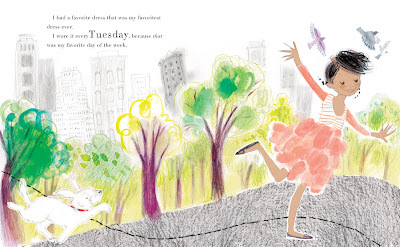 All illustrations are copyright ©Elicia Castaldi, 2012, kindly shared by Random House. The review copy was sent by the publishers, Random House. If you make a purchase using the Amazon links on this site, a small portion goes to Great Kid Books (at no cost to you!). Thank you for your support. "Trouble cruised into Tupelo Landing at exactly seven minutes past noon on Wednesday, the third of June, flashing a gold badge and driving a Chevy Impala the color of dirt. Almost before the dust had settled, Mr. Jesse turned up dead and life in Tupelo Landing turned upside down." Bang! Right away, you know that someone's died, trouble is turning everyone's life upside down. The narrator - Mo LeBeau, a rising sixth grader - introduces herself right in the next paragraph, letting the middle grade reader know just who's who. Mysteries are nothing new to eleven year old Mo LeBeau. She's been trying to figure out who her "Upstream Mother" is for years. You see, she was found as a tiny baby floating on a river after a hurricane struck this rural North Carolina area - thus her full name, Moses. Every chance she gets, Mo floats bottles with messages to her Upstream Mother - hoping that the river that brought her to Tupelo Landing will also bring her birth mother back to her. And there's also the mystery of the Colonel - Mo's adoptive father and the owner of the local town cafe. Who exactly was he before his amnesia wiped away his memory? But as Mo tells us, trouble really comes to town when the law arrives, flashing a gold badge and driving a beat up Chevy. At first, Detective Joe Starr suspects Mo's best friend Dale for committing the murder of Mr. Jesse. So Mo sets about trying to solve the murder case herself. One thing leads to another, and pretty soon the whole town is trying to figure out who has kidnapped Mo's adoptive parents, the Colonel and Miss Lana. "Pairing the heartbreaking sadness of children who don’t get their fair share from parents with the hilarity of small-town life, Turnage achieves a wickedly awesome tale of an 11-year-old girl with more spirit and gumption than folks twice her age." The review copy was kindly sent by the publishers, Dial Books, an imprint of Penguin. If you make a purchase using the Amazon links on this site, a small portion goes to Great Kid Books (at no cost to you!). Thank you for your support. The end of summer is here; every time turn around, the kids I see have grown again -- sprouting up, up, up! So once again, we go through our closets trying to put away clothes they've grown out of and save them for someone else. But what do you do about that favorite dress or shirt? Can you really give it away? I Had a Favorite Dress captures this feeling with perfect zip and zing! A young girl starts the story declaring, "I had a favorite dress that was my favoritest dress ever." Can you relate to that? I so remember those days when my daughters would ONLY wear dresses, and our friend across the street would only wear orange. Preschoolers are particular! But what happens when this little girl grows and realizes that she is now too big for her favorite dress? Her mama tells her not to worry, "Don't make mountains out of molehills. Make molehills out of mountains." So together, they come up with a way to turn the favorite dress into a brand new shirt! But then the sleeves become too tight, and once again they need to create something new - a tank top! At each turn, mother and daughter work together to come up with creative solutions: a skirt, a scarf, socks and a hair bow. I adore the artwork and the spirit of this story. My youngest said to me, "It's so creative!" 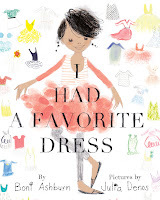 She was full of smiles as she realized the pattern in the story and started predicting what the little girl would make next out of her favorite dress. And then toward the end, she loved how she couldn't quite predict what she'd make next. After we read it, she wanted to go back and count all the things the little girl made out of her original dress. I also think my daughter could relate to the little girl feeling sad about growing out of clothes - growing up isn't all easy, as kids definitely know. Boni Ashburn's rhythm and internal rhyming make this an excellent read aloud - the language is delightful. The repetition really leads to kids being able to predict what will happen next. The story structure around the days of the week is also perfect for preschoolers and kindergartners who are mastering that progression of time. And yet, older children will smile reading this, remembering back to the clothes they loved, loved, loved wearing when they were younger. It would be fun to ask kids to compare this to Simms Taback's Joseph Had a Little Overcoat. Both show how you can think of creative solutions to problems. The Kirkus Review suggests that both are based on the Jewish folktale, "The Tailor". I smiled inwardly with the way that Julia Denos drew the young girl and her mother with medium-toned skin - not clearly one race, but perhaps Latina or African American. It isn't an overt statement, but a lovely reflection of my students today. I Had a Favorite Dress was chosen as a finalist for the 2011 Cybils Fiction Picture Book Award. I especially enjoyed Jen Robinson's review. The review copy was kindly sent by the publishers, Abrams Books. If you make a purchase using the Amazon links on this site, a small portion goes to Great Kid Books (at no cost to you!). Thank you for your support. Did you ever sit spinning the globe as a child, then poking it to see where your finger landed? I remember running my finger over the raised mountains of the Alps and the Himalayas, imagining just how tall those mountains were. There is something amazing about a spinning globe that enables children to see the connections between countries. The Barefoot World Atlas brings this concept to an iPad app, enabling young children to spin the globe to search for information on countries around the world. Young children have a difficult time envisioning the large extent of our world. Our first graders are learning about different regions of the world, but it's hard to see how the separate parts relate to the whole. This app provides a wonderful opportunity to let children explore the globe. 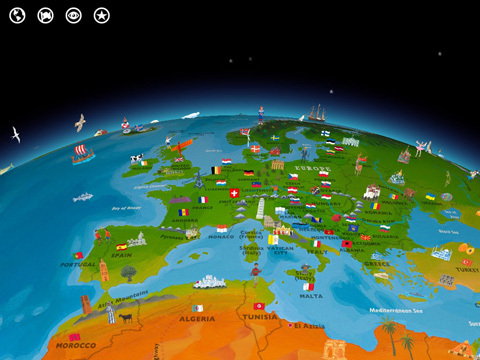 Zoom out, and you can spin the globe to find a region you want to explore. Pinch and zoom in to focus on a particular country or feature. Tap a country to read pertinent facts, such as the capital, the current time and temperature, the land area and population. 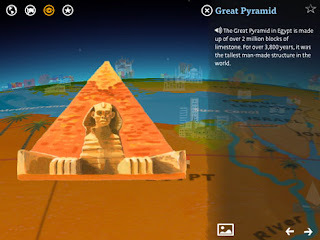 Even more interesting, tap an illustrated feature such as the Parthenon in Greece, the Library of Celsus in Turkey, or the Imam Ali Mosque in Iraq and a narrator will read a short paragraph explaining about this place. Tap the photo icon and you can see a full-color photograph - bringing the "real world" aspect into focus for young children. These featured items range from important historic buildings to local animals to native people. 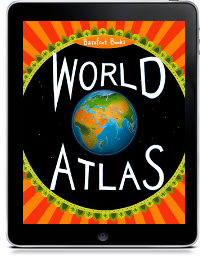 The Barefoot World Atlas is a good example of a nonfiction iPad app for our youngest students - making them interested in exploring the world around us. It combines many ways of engaging with material: attractive illustrations, interesting photographs, intuitive navigation, clear narration and sound effects, and - most importantly - the opportunity for young children to direct their own exploration. It does have some limitations. There is an odd sense of material left out - most major cities and capitals are not labeled, and many known important features are left out. It is clear that the developers worked hard to keep the material accessible and not overwhelm young viewers, and that is important. But the sense of items missing is noticeable to children, who will look for features and cities they know. I know several classrooms that have enjoyed using this app with first graders exploring the regions of the world. I look forward to exploring other apps like it, helping children explore the world around us! Do you love sharing nonfiction with your children? Head over to The Nonfiction Detectives today for more excellent Nonfiction Monday reviews from around the Kidlitosphere. The review copy was kindly sent by the publishers, Barefoot Books. If you make a purchase using the Amazon links on this site, a small portion goes to Great Kid Books (at no cost to you!). Thank you for your support. "The “KidLitosphere” is a community of reviewers, librarians, teachers, authors, illustrators, publishers, parents, and other book enthusiasts who blog about children’s and young adult literature. In writing about books for children and teens, we’ve connected with others who share our love of books." Each year, this loose group comes together for the KidLitCon. It's a small gathering, one that welcomes newcomers as we share our common passion for children's books. So I am very happy that registration for KidLitCon 2012 has just opened. This year's gathering will be in New York City, on September 28th and 29th, 2012. And yes, I am very much looking forward to it. I adore the small size of KidLitCon - so much smaller than most of the conferences I attend. I really feel like I have the chance to connect with friends I've made through the blogging world. Find out all the details here at the KidLitCon 2012 info page. This year's hosts are the wonderful trio of Betsy Bird (A Fuse #8 Production), Monica Edinger (Educating Alice), and Liz Burns (A Chair, A Fireplace and a Tea Cozy). The preconference on Friday will be filled with visits to publishers, helping bloggers and publishers establish productive relationships. The conference on Saturday will be held at the the main branch of New York Public Library, the Stephen A. Schwarzman Building. Registration will be limited to 175 participants, so make sure you sign up early. That means RIGHT NOW! Click over to the KidLitCon12 registration page. Did I tell you the amazing news? The conference itself is free. Yes, I whispered that. Free. Can you believe it? No, the trip itself is not free. But hot-diggity-darn, a free conference? Too good to pass up. And a great time to be had by all. Do you get the sense how much I'm looking forward to this? Yes, indeed. Many thanks to Betsy, Monica and Liz for all the behind-the-scenes work that goes into planning this event. There are times a novel settles into my heart and stays there. When I pick it back up, the narrators' voice fills me once again with emotion and resonance. 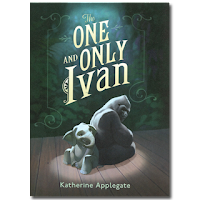 The One and Only Ivan, by Katherine Applegate, is a story that will touch you, that make you wonder about what it means to be human, to be alive, that will bring tears of grief and the warmth of true friendship. It would make a perfect book to read aloud as we near the end of summer or to start the school year. "I am Ivan. I am a gorilla. The names are mine, but not me. I am Ivan, just Ivan, only Ivan. Brutally captured as a youngster, Ivan has lived in his "domain", a small concrete cage with glass walls in the Big Top Mall, for 27 years. Alone. Except not quite alone. When everyone leaves the mall, he visits with Stella, the wise old elephant who "has eyes like black stars and knows more than I will ever know." Can you imagine living for 27 years on a concrete pad surrounded by glass walls inside a shopping mall? Can you imagine thinking you are the last gorilla left alive on earth? What's the difference between animals and humans? 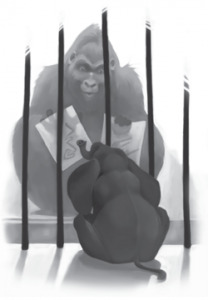 Applegate takes readers inside Ivan's mind, asking them to think about these questions, to wonder about the implications of keeping animals in captivity. But Applegate carries it further, as she crafts a story where Ivan is not alone, where he is motivated to help a friend, and with the help of his own friends he creates an imaginative solution. Is this partly fantasy? Surely, it is. Or perhaps it is. Or maybe not. Will we ever know what a gorilla is really thinking? What I do know is that this is a book that will make young readers (and their parents!) think. And feel. And wonder. That, my friends, is the best kind of book. The One and Only Ivan is written in spare, poetic text with short chapters and occasional illustrations throughout. This design of the book is beautiful - this is certainly one to get in print, not as an ebook. The plentiful white space makes it accessible to 4th graders, even some 3rd graders. And yet it is a big book, with well-realized characters and emotional punch, one that 5th and 6th graders will connect to. In fact, my biggest complaint is that the cover seems a bit "sweet" for the weight of the story. Applegate was truly inspired by a newspaper story of the "real Ivan" who was kept in a shopping mall in Washington state for nearly three decades before finally being moved to Zoo Atlanta. Read more about his story here. The review copy was kindly sent by the publishers HarperCollins. If you make a purchase using the Amazon links on this site, a small portion goes to Great Kid Books (at no cost to you!). Thank you for your support.